This is not your typical rags to riches story. Meet the story’s main character: Brian Sawyers. 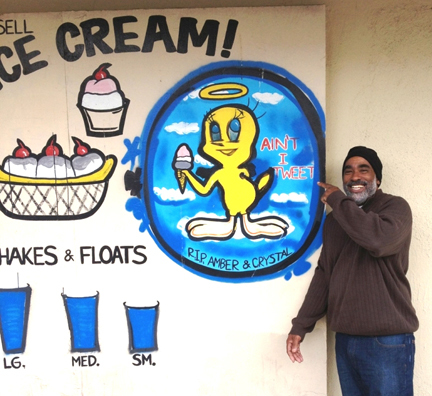 He is the owner of BD Burgers located on Central Ave in Los Angeles, but before becoming a business owner, he has journeyed through a lot of experiences that have made him a better person. This “new man” is one who Brian says can be attributed to by looking at “the man in the mirror”. Just like it takes seasoning to perfect a burger, the same metaphor applied to Brian's life, as he did not always live the best life. His life was seasoned by ups and downs; ups being with the birth of his daughter Amber N. Griffin Sawyers, downs with being incarcerated. Brian was arrested for drug-related charges and sentenced to life in prison. Fortunately, he only served a 12 year-8 month sentence after getting to see a judge again. He was living a controversial lifestyle. While in prison, he experienced undesirable circumstances and he came to a realization that he didn’t want to work for anyone when he got released. While in prison, Brian received the worst news any father could get. His only daughter at the time, Amber, was diagnosed with a rare children’s disease Rhabdomyosarcoma after being sick for a period of three months. “She was diagnosed with cancer and she was given like 60 days to live. I was running ten miles a day in prison. I was the healthiest in my life. I just knew that, you know, just let my baby see me. And some kind of way it happened,” he said choking back tears. Brian was then able to visit Amber in the hospital, with guidance of police officers. Her primary doctor heard about how healthy he was and Brian was able to donate blood that day. That would be the last time he would see Amber before she lost her fight to cancer in January 1999. Brian was released in 2000 and was unfortunately unable to attend her funeral. He says Amber saved his life. “So many things centered [on] Amber. If I’m praying about something I’ll just say to Amber, go take it to God and it happens. You’d be amazed. She’s amazing. She definitely still lives,” he said with a big smile on his face. Brian had a new mission. With the help, inspiration and motivation of friends, he was able to start BD Burgers, named after a dear friend, B.D. His initial partner was Drack, who gave Brian the money to start the business. The nearby local church also helped out by giving the business a few months free of rent. The fast food spot is known for its delicious burgers, mouth-watering lemonade, breakfast foods and flavorful tacos. I myself got to sample the turkey burger, which was a delicious clash of flavorful ingredients giving my palette an experience I didn’t want to end. There is also an ice cream parlor section of the restaurant, which Brian dedicated to Amber. Not only does Brian offer delicious entrees, but services to the community. Through BD Burgers he mentors the youth, caters to many local events and helps to mentor felons. Because of the beauty he saw in his daughter, he has taken on a new mission to always show those he cares about that he loves them and to help those in the community. This is why BD Burgers will be catering for the Sabriya’s Castle of Fun Foundation Blood Drive and giving a free burger to everyone who donates blood that day. Sabriya’s Castle of Fun is committed to helping children with blood-related illnesses and their families with their needs. He has also decided to participate in Taste of Soul 2013 as a vendor. From everything that Brian has experienced, he had advice to give for those who are going through similar situations with themselves or loved ones. “You got to stay healthy with your family. You are an essential element of their life. Sometimes in the Black family, we don’t celebrate love. We celebrate holidays, we celebrate birthdays, we don’t just celebrate love. And now I try to make it my daily thing to call one of my siblings and let them know I love them,” Brian said. 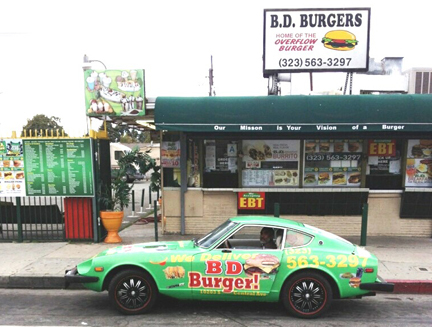 BD Burgers caters as well, so if you are interested, please contact 323-563-3297.